6/15/11 - This is it! 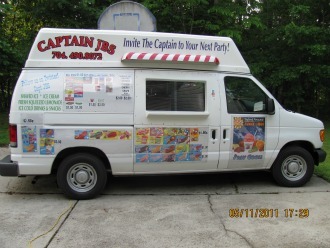 Complete turn key Ice Cream & Shaved Ice Truck with absolutely everything you need to be in business today. 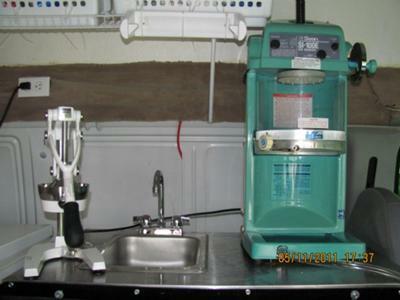 It features the Swan SI 10 Block Ice machine (not a cheap cubed one). Sink with hot water a 5 gallon tank and a 7 gallon holding tank. A 17 cubic foot freezer and a 5 cubic foot refrigerator (this was converted from a freezer for cold drinks). The unit also has a professional lemon press for lemonade. A credit card machine that gives your customer a receipt. The unit runs on a 5000 watt power inverter and the inverter is on separate new batteries that will not interfere with starting the motor. Inside and outside lights. A double window to serve your customers. 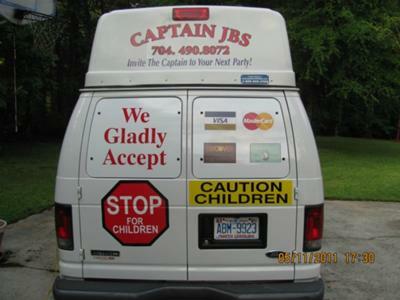 The vehicle does not have any ice cream stickers on the outside as they are all on magnets and covered with Plexiglas (Lexan). An automatic swing arm on the driver’s side for safety as well as ice cream music and an auto alarm. External power so the unit can easily plug into home power. She's a gem in pristine condition! Contact: (704) 490-8072.